He was born in 1200 near Kyoto which was, at that time, the capital of Japan. When he was fourteen he was formally ordained as a monk and entered a monastery at the foot of Mt Hiei to begin his training. In 1217 he moved to Kennin Monastery – also in Kyoto – and studied there until 1223. He then accompanied his abbot, Myozen, to China. The purpose of this journey was to engage more fully with Ch’an Buddhism, the Chinese precursor of Japanese Zen. In the Chinese monasteries the main type of spiritual practise was the chanting and repetition of Koans. (Koans are short phrases which help to focus the mind) However Dogen was rather disappointed with this type of practise. Dogen wanted to return to Japan but under the guidance of a senior priest Rujung, he learnt the art of silent meditation. In this practise the goal was to silence the mind and loose awareness of mind and body. In this type of meditation the goal is to still the mind, thinking of neither good things or bad things. With this new knowledge Dogen returned to Japan and started to write and teach about these new doctrines. In 1233 he opened Kannondori Temple in Fukakusa and was appointed to be head monk. 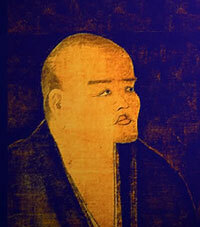 Dogen was a prolific writer of both poetry and guidance on Zazen meditation. In 1252, Dogen became ill and in 1253 he died in Kyoto.